©Felipe Galindo, Feggo. 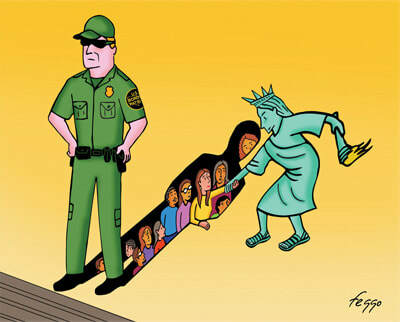 The Statue of Liberty rescues people stuck in the shadow of the deportation force, 2017. Thank you so much for your interest in the immigrant community. We write to share with you our concerns regarding the immigration reform currently before Congress. As immigrants to the US, we found President Franklin Delano Roosevelt’s Four Freedoms speech eye opening and inspiring, because through it we learned that America considers freedom from fear to be an essential human right. We come from countries where people’s daily lives are woven around fear. For example, Mexico is living through a humanitarian crisis that has been compared to the wars in Syria and Afghanistan. Kidnappings, extortions, and disappearances are a fact of day-to-day life for those who live there. Government numbers for disappeared people from 2006 through 2015 have reached 250,000. Some NGOs put the figure far higher. Mexico is but one case; other Latin American countries face even more challenging realities. Many immigrants to the US are fleeing war and violent crime. Others escape poverty and inequality. We wish we had known while still in our own countries that we had the right to not be afraid! As immigrants we have learned that the US is an exemplar to the world for many reasons, and the ideal of freedom from fear is one of them. Supporting a fair immigration reform is essential to secure the freedom from fear of those who came to the US seeking for a better life. They left everything behind and decided to start a new life in the US for a reason. Whatever threat forced them to leave their country is still there. Having known the US’s culture of freedoms, facing violence or truly extreme poverty again will be devastating for many of them. They would live in fear, and America would have failed to protect their human rights. Wishing to give a face to their stories, we have sought to interview many immigrants in different conditions for our newspaper. Many have denied to tell their story for publication always giving the same reason: “I am scared.” So many immigrants live in fear. So, despite the tradition of freedom that America holds up to the world, the US fails to guarantee a large part of its population the four essential human freedoms promulgated by President Roosevelt. As immigrants to the US, as members of the Latino community, and as human beings, we urge you to support fair immigration reform. We believe strongly that standing with immigrants will lead America to be, once again, a model of compassion and strength in the defense of human rights.